The Hong Kong Parents Association (HKPA) serves USC parents and their families in Hong Kong and Southern China. For more information and membership opportunities, contact us at uschkpa@gmail.com. 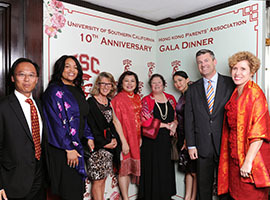 The USC Hong Kong Parents Association celebrated its milestone 10th Anniversary in 2014. Over the past ten years, many individuals, USC staff and parents alike, have dedicated their time and energy to strengthening the bonds between our Trojan families in Hong Kong/China and USC for the benefit of our students. The Hong Kong Parents Association was founded in 2004 with the clear knowledge that parental involvement enhances student success and experience at USC. Our founders and sponsors from USC worked hand in hand with our local founding parents to create the HKPA and its support networks. Over the past ten years, our membership has grown from approximately 20 founding families in 2004 to more than 200 families today. Our Trojan Family continues to grow from strength to strength. 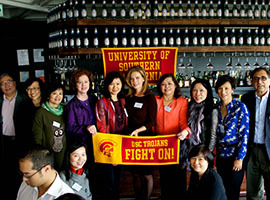 We meet and build relationships with new Trojan parents through special events, such as dinners with key USC guest representatives, and regular social tea gatherings and cocktail conversations. Here, we get to know our fellow Trojan family members and share information with parents who may have questions regarding their student’s experience at USC. We promote student development over the summer and winter holidays by organizing leadership seminars, informal career talks, workshops by business and industry leaders, networking opportunities and parent-sponsored internship opportunities. We help local students achieve their academic goals through fundraising initiatives. For example, funds raised at our 10th Anniversary Gala will go toward our HKPA Student Fund to benefit Hong Kong students. We support USC’s Hong Kong and China office by attending USC-led events such as Discover USC, the Spring Reception, and the USC International Kickstart new student orientation in Hong Kong and Shenzhen. We also visit local high schools and college fairs together with USC representatives. As USC expands its presence in China to reflect the increasing role of Chinese students at USC, the HKPA likewise continues to evolve by raising its activities and profile in Southern China as well as Hong Kong. If you are a parent of a USC student or graduate, we welcome you to join us to better serve our students and families.